Now in its seventh year, the modern MOOC movement crossed 100 million learners to achieve a total of 101 million. At the same time, we are seeing a decrease in the number of new learners signing up. In 2018, 20 million new learners signed up for at least one MOOC, down from 23 million the year before. Despite the slowdown, the number of paying users may have increased. MOOC providers’ constant tweaking of the model seems to be paying off, given providers such as Coursera are hitting record revenues ($140 million in 2018 for Coursera). By the end of 2018, over 900 universities around the world had announced or launched 11.4k MOOCs. That includes around 2,000 new courses that were added to the list this year (down from 2,500 courses in 2017). 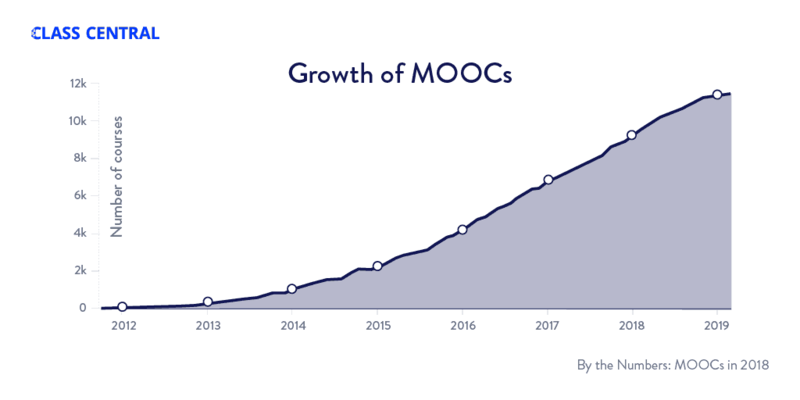 The number of available MOOCs has grown dramatically in the last few years due to scheduling policy changes, but since user growth hasn’t kept up, each course is getting fewer users. According to Forbes, Coursera’s estimated revenue for 2018 is $140 million, up from Class Central’s estimate of $100 million in 2017. According to Udacity, its own global revenue grew by 25% in 2018. This makes its revenue just shy of the $90 million mark, up from $70 million last year. FutureLearn, which is looking to raise £40 million, had a revenue of £8.2 million in the last fiscal year (to the end of July 2018). Unfortunately we don’t have any numbers to share for edX. In 2018 we saw MOOC providers announce a number of new online degrees. Coursera, edX, FutureLearn, and XuetangX all announced new degrees; this took the total number of online degrees to 47, up from around 15 in 2017. This string of announcements led me to call the current moment the “second wave of MOOC hype.” Many of the degrees that have been announced are not yet live, nor even accepting applications. Many universities, including Arizona University, the University of Pennsylvania (an Ivy League institution), UC San Diego, and Imperial College London jumped into the MOOC-based degree game. Others — such as Georgia Tech and the University of Illinois — announced additions to their existing online degree offerings. 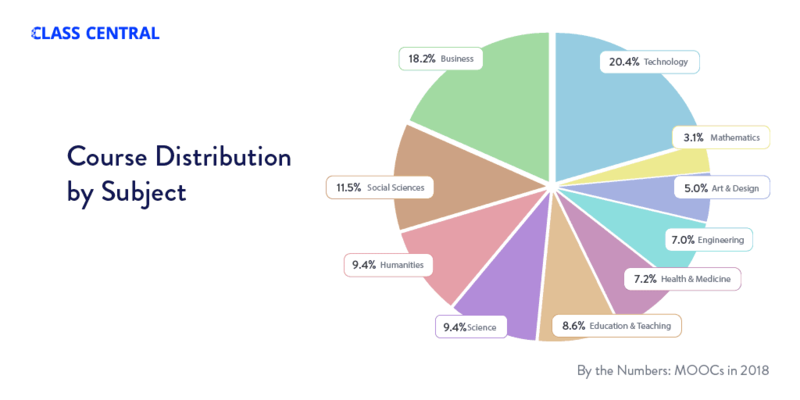 FutureLearn leads the pack with the highest number of MOOC-based degrees, but unlike other providers, their degrees don’t tend to be much cheaper than their online or in-person counterparts. Many of the new credit-bearing options on the FutureLearn platform are shorter postgraduate certificates. Here is a complete list of MOOC-based degrees. Microcredentials were no longer the hot thing in 2018. The focus has moved to online degrees, although over 120 new Microcredential programs were launched this year. There are around 630 Microcredentials of 10 different types. The bulk of these came from just two credential types: Coursera’s Specializations and edX’s Professional Certificates. Coursera launched a new type of Microcredential called MasterTrack, which is a pricier version of edX’s MicroMasters. Overall, the distribution of courses across subjects has remained quite similar to last year. Forty percent of courses belong to the categories that are the easiest to monetize: business and technology. 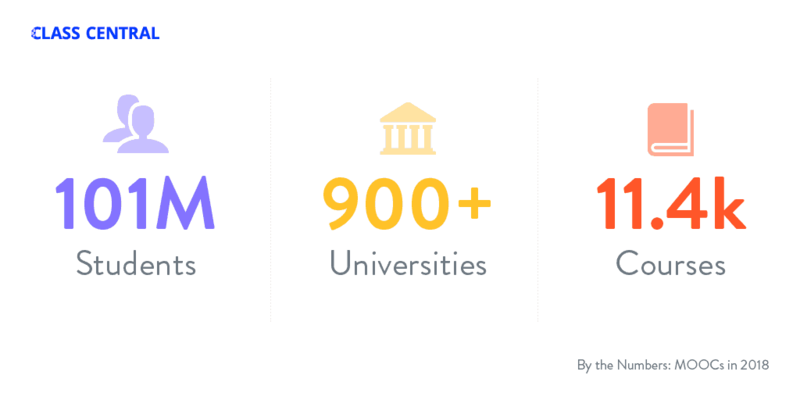 Coursera is still the largest MOOC provider in the world with over 3,100 active courses. (Coursera has launched around 3,800 courses, but many have been removed.) EdX currently boasts a catalog of 2,200 courses, while FutureLearn is approaching the 1,000 course mark. This article is just one in our 2018 MOOC Roundup Series. Find the whole series of articles here, and discover everything MOOCs in 2018 — from the most popular classes, to overviews on developments in MOOC platforms, to looking at the MOOC future. MOOCs Started Out Completely Free. Where Are They Now? fix you contact us link. i am trying to sign up for courses but it is not working. if i can not contact you i can not recommend an online service that does not have knowledge of websites and how they work. yes i have an account i get auto logged in every time i visit your website. i also get emails witch is the main way i visit your site. i have missed 2 courses i don’t want to miss any more.